"Your fine jewelry is meant to give you a lifetime of enjoyment. Whether it’s a repair or a refurbishment, we’ll help make it as good as new." Did your grandmother ever tell you that “an ounce of prevention is worth a pound of cure”? Most grandmothers seem to know that one; I think they must all graduate from some special academy or something. Hopefully you took the lesson to heart, because when it comes to jewelry, she definitely knew what she was talking about. If you’ve ever found yourself searching for a missing diamond in the grass or between the seat cushions of the couch, you probably made a vow to never again neglect your precious jewelry. Even if you found your stone (it sometimes happens) it’s still a lot of stress and heartache. Personally, we like to eliminate those things from our life, and we’re here to help you do the same. Fortunately, at Barbara Oliver Jewelry we make it incredibly easy to avoid jewelry mishaps by offering free inspections and cleanings. It will cost you zero US dollars (which is an even better bargain in Canadian dollars) to have us look at your jewelry and make sure everything is in tip top shape. We don’t consider this service an opportunity to upsell on unnecessary repairs. As grandmother might also have told you; “if it ain’t broke, don’t fix it.” We like that one too. Using a loupe we’ll take a close look for cracks or porosity in the setting, bent or worn prongs, loose or chipped stones, and thinning on channel settings and the shank. Plus anything else that might be amiss. We’ll do this even if you bought it somewhere else (or inherited it from your aforementioned wise grandmother). You may have noticed that over time your jewelry appears to have lost its luster. Oils from your skin, cosmetics and lotions, and dirt and grime can dull the shine of your stones. We once inspected a ring where some of the side stones were only being held in place by cookie dough! At least that what we think it was, but no one actually tasted it, so we’ll never know for sure. Likewise the precious metals in your settings can also become dull and tarnished. Scratches and dents, chemicals, and other contaminants can compromise the finish of your gold, platinum, and silver jewelry. So after checking out your jewelry we’ll give it a bath (usually in the ultrasonic, but only when it is OK to do so) and then we’ll give it a quick buff and polish. Again, we do this for no charge – we just want you to have shiny things to wear. We know the right way to clean your jewelry; not all metals and stones are the same. Some stones are porous or too soft to be cleaned like we would a diamond or other hard/dense gem stones. If you have any questions about the proper care and maintenance of your jewelry just ask us. You can also check out our jewelry blog on caring for your jewelry; with proper and timely care your jewelry will reward you with a lifetime of enjoyment. If we find any issues with your jewelry, we can fix it the right way, in house. But you can relax, we won’t sell you services or repairs that you don’t need, and frankly, in comparison to most other jewelers, we don’t charge a lot either. Before getting started we’ll show you the problem and inform you as to what needs to be done. 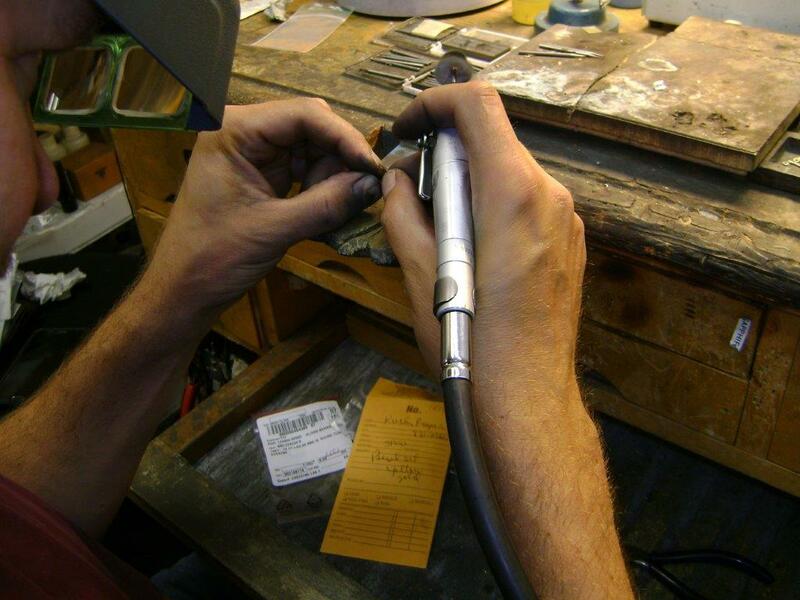 Our comprehensive jewelry repair services includes ring sizing, mountings, stone replacement, retipping prongs, necklace repair, bracelet repair, clasp replacement, and full refurbishment. If your ring doesn’t fit you anymore, we’ll determine your proper ring size and professionally size your silver, gold or platinum ring to fit you perfectly. If you have a knuckle that exceeds the size of your finger we can also add sizing beads or a sizing bar to stop it from spinning. Ring resizing services are available for all ring sizes. Is your diamond loose in its setting? Sometimes it’s as simple as compressing the prong back into shape. In other cases one or more prongs may be broken or worn down. If that’s the case, we’ll show you why the prongs have to be fixed. Proper maintenance and prong re-tipping can prevent you from losing your gemstones, and the fix is generally easy when we catch it in time. Sometimes gemstones go missing or break. We can replace any gem stone in any setting – solitaires, three-stone rings, tension settings, channel settings, bezel settings or pavé. Or we can set loose gemstones in your chosen mounting. On occasion, precious stones (yes, even diamonds) can chip. Sometimes we can hide a small chip under a prong and avoid having to recut the stone. If not, we’ll explain how the stone will be recut, and what loss of carat weight will result from recutting it. Sometimes clients even come in with an older stone and want it recut to a more modern (and brilliant) cut. Our stone cutter is really good at coaxing older cut, duller stones to show more fire and brilliance. Is your favorite bracelet broken and unused? We can inspect and repair broken chains, pendants and charms – or replace worn out clasps and closures. We can quickly refurbish your necklaces, bracelets and jewelry chains to look new again. With time and normal wear, the cords of pearl necklaces and pearl bracelets become brittle and susceptible to breakage. Let us prolong the life of your pearls by restringing them and inspecting the clasps. We have a comprehensive selection of watch batteries, and can replace them while you wait. Sometimes the problem is a little more troublesome, especially for fine mechanical watches. When an overhaul or replacement of parts in the movement is required, we have a close relationship with a Swiss trained watch maker, who does exceptional work. If we have to send the watch out we take responsibility for the repair, and make sure it is done to our satisfaction. Naturally we’ll give you an accurate quote and time frame for the repair. We carry many of the most popular findings, which is the trade term for the clasps, bails, jump rings, links, ear wires and backs that make up a finished piece of jewelry. We know you may experience separation anxiety when your repair is delayed, so generally we avoid the need for “special orders” for clasps or settings. In fact, most of our repairs are received, recorded, finished, polished, and delivered within three working days. Depending on the work on the bench, or your level of panic, we can also complete many jobs while you wait. Full jewelry service, reasonable pricing, and fast turn around – it’s all part of our quest to become your trusted family jeweler. Barbara and her staff did an outstanding job bringing my wife’s engagement and wedding rings to “better than new” status after over 36 years. Barbara was professional and courteous, explaining all the details of what she would do and why. The end result was nothing short of stunning. And the pricing was more than fair. This was my first experience here and she has won my continued business! Recapture the pleasure your jewelry was meant to bring.